End users are decision makers. But often they aren’t given the tools to assess their business and draw conclusions. Data exists in silos that are inaccessible to those who understand them. Instead, BI reporting tools and data warehouses are controlled by IT. Rightly, IT is the guardian of corporate data, but it’s not the function of IT to extract business insight from it. Solutions need to be available for users to interact with data without burdening IT when doing so. Analyze – analyze business needs and identify KPIs to help in decision-making. Data Sources – determine data points necessary to drive KPIs and identify their location within corporate data sets: OLTP (Online Transaction Processing) System, Excel, CRM, digital data, corporate files, etc. Evaluate existing original sources of the data. Relationships – understand relationships of required data points and identify effort needed to bring them together. Architecture – determine suitable data architecture and data model. Repository – evaluate need for creating OLAP (Online Analytical Processing) cubes and the need for a data warehouse or other central reporting repository. Compare technologies best suited, the merit of building a data warehouse or data mart, and the value of using automation tools, data virtualization, and ETL tools. Visual Design – evaluate dashboard needs and tool selection. UD³ considerations for visual design. Construct data visuals using UD³ to optimize creation and delivery. Understand the main question(s) the dashboard is to answer, who the audience is, how technical the usability should be, and adhere to design best practices. Optimize dashboard performance when delivered through Tableau Server. Training – client training and project hand-off. Optional long-term assistance and support. 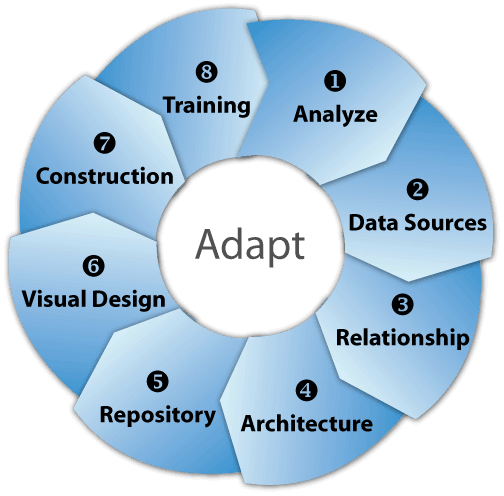 Contact a BI consultant to learn how the Adapt approach can improve your business reporting and decision making.